As one of the leading names on a competitive market, the popularity of Can-Am stands a testament to the brand's high standards in manufacturing. With their forward-thinking designs brought to life in exemplary manufacturing, their all-terrain vehicles are the perfect blend of function and fun. When you need a wide range of Can-Am parts at the ready, we have you covered with all the essentials for your favorite set of wheels. Best of all, our parts are OEM which means they are direct from the manufacturer to help ensure the performance of your model. When looking at the history of the Can-Am brand, there are a few things worth noting as a fan of this brand. For starters, while the BRP company was founded in 1942, they didn't create the Can-Am branch until 1972. They started with motorcycles under this new name but eventually branched off into all-terrain vehicles in 1998. While they weren't the first on the scene, they made up for a lack of time by way of innovation and overall impeccable standards in manufacturing. 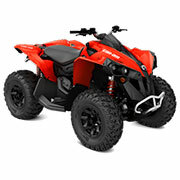 In fact, their Traxter model was named the ATV of the year by ATV Magazine the year after it was first introduced. Their early models focused on sport ATVs made for adrenaline seekers looking to traverse tough terrains with ease, speed, and total control. This intrepid manufacturer wasn't content to rest on its laurels and would go on to introduce a few important innovations. For starters, they were the first manufacturer to offer a two-seater ATV which changed the way people rode these vehicles. Whereas an ATV was primarily a ride for adventure seekers, the two-seater model opened them up to a more family-friendly activity. The brand would also go on to recognize a need for ATVs made to work with increased towing capacities, higher engine displacement, and other features which turned ATVs into work vehicles for construction, farming, and other industries in need of a rugged vehicle. Whether your ATV is primarily for work or play, our selection of Can-Am OEM parts has you covered. We offer one of the most diverse selections of Can-Am OEM parts for an easy shopping experience and successful outcome. When shopping for your favorite set of wheels, the first thing to look at is the year and model. We offer a comprehensive collection of solutions ranging from 1999 to the most current year in a wide selection of models. Whether you are looking for a part for a 1999 Traxter or a 2018 Renegade, we have you covered. While having the right model and year is important, there are also slight differences in the various available series worth noting. For instance, there may be differences in specs between a Renegade 570 and a Renegade 850 which will help determine the right part for your ride. With such a wide range of models, years, and individual series at the ready, it's easier than ever to find the right Can-Am parts for your favorite ATV. Offering a wide range of models, years, and series is only part of what sets our inventory apart. We also focus on bringing our valued customers an inventory that is impressively diverse in available part types. Whether you need spark plugs, starters, drive trains, or bearings, we have you covered with an exhaustive selection of parts. From clutches to chains, it has never been easier to find the ideal solution for the individual specifications of your ATV from Can-Am. We focus on bringing you only high-quality solutions for options you can choose with the utmost confidence. From the quality of the materials used in the part to getting the right performance outcomes, every solution meets high standards while still maintaining affordability for the best of both worlds. When looking to repair your ATV to get back in the action, find it all right. Order today and get back to doing what you love! Here at Ski-Doo Parts Nation, we are committed to an outstanding customer service experience. If you have any questions about any of the options we proudly offer, please reach out for assistance. Our knowledgeable staff is always happy to help in any way.